ShortScale :: View topic - Design yourself a signature... Build ideas. Design yourself a signature... Build ideas. Posted: Tue Jan 26, 2016 8:20 pm Post subject: Design yourself a signature... Build ideas. 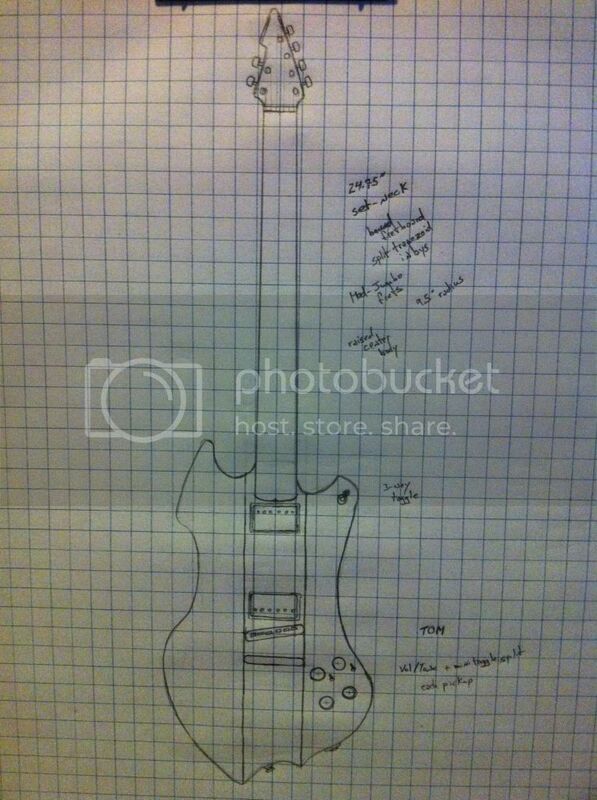 So i was thinking about making a random new guitar designs thread, maybe as a build ideas thread for the people with the balls and the equipment to do such things. And that is what i came up with. Skate/Surfcaster body with the ugly top horn fixed, hotrails/JM pickup combo. No guard, maple bound neck, reverse headstock, control plate for easy maintenance. I'd like a 24 fret SG, blocked neck, vintage sunburst or two tone fireburst finish, but not painted black on the back and neck like Gibson usually does, instead I'd like it natural wood on the back and neck like a Firebird. Three pickups either three mini-humbuckers or two mini's and one PAF at the bridge. White batwing pickguard. The usual control setup with maybe a push-pull knob for coil splitting. Mustang with 1 piece maple neck 1 piece walnut body. Walnut plug and skunk stripe cut from same walnut as body. Glossy clear coat on it all. Black pickguard and pickup covers. Unfortunately my tastes are limited to vintage stock stuff. 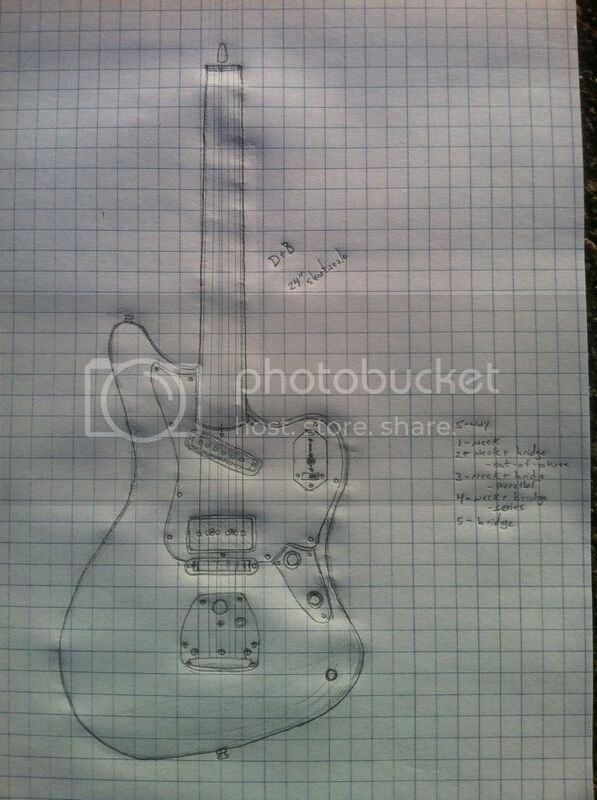 A sig model for me at this point would probably be a vintage correct jazzmaster or a silvertone 1448. The only "daring" mod on my jazzmaster is a mastery bridge. I'm boring. 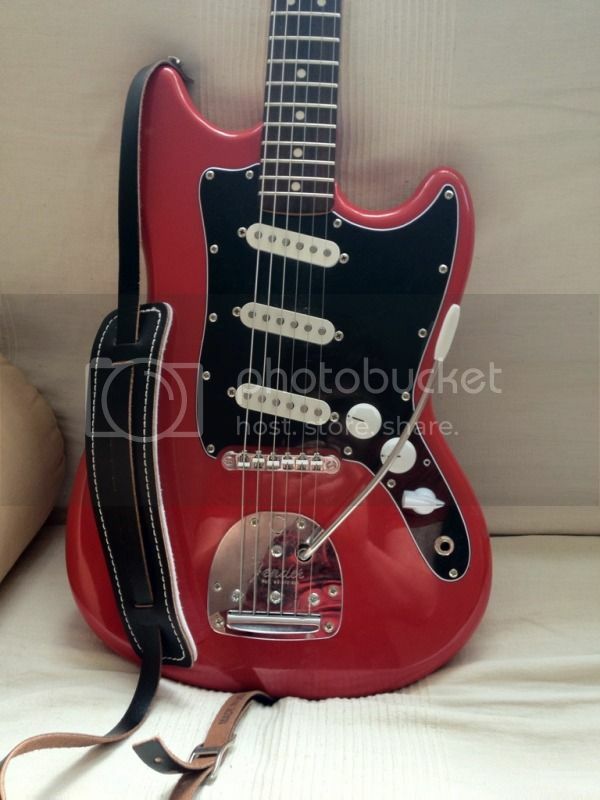 George's bratocaster is tight though. Edit: actually now that I think of it a silvertone 1448 with a bridge pickup would be so sweet. Not like a 1449 though, needs to keep that short scale and small neck. 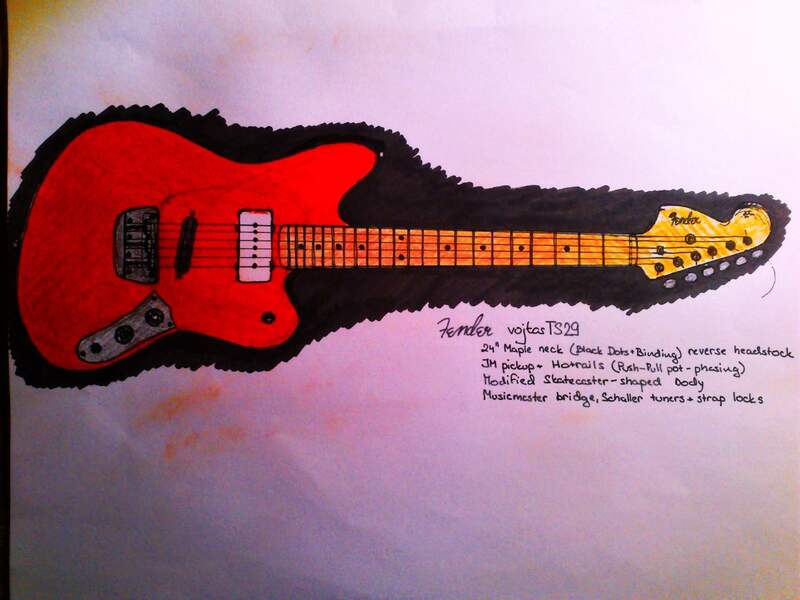 Jaguar neck scale and body shape, with a Jazzmaster neck pickup and Telecaster bridge pickup and ashtray. Jag/JM vibrato with Staytrem bridge. Vintage-style frets, radius and tuners. One volume pot (500k), 3-way toggle, strangle switch and series/parallel switch. No rhythm circuit. Someone build me this please. Posted: Wed Feb 10, 2016 3:02 pm Post subject: Re: Design yourself a signature... Build ideas. A hardtail shortscale with Jazzmaster pickups. Why has no one done this? Plopswagon's hardtail Jazzmaster is pretty damn close as well. yeah, I totally agree. I've probably seen it before, but no specific memory. I do remember hearing it when George made some recordings a while back... starting up a new band and all. Sounded amazing! George, whatever happened with the band?